Make your glaze: In a small saucepan, add butter, miso, and honey and melt, stirring frequently. Remove from heat once all ingredients are smooth and incorporated. 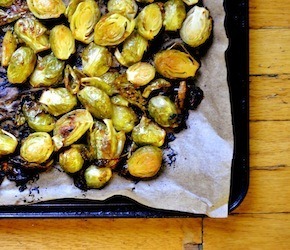 Lay your Brussels sprouts out on a parchment-lined baking tray. Drizzle your miso sauce over the Brussel sprouts and give them a quick stir so they all get coated. Roast in a 400 F oven for 30-35 minutes, until golden brown and soft.